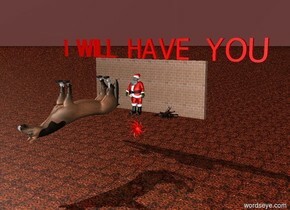 There is a horse leaning back. 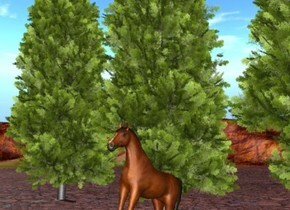 There are 4 trees behind the horse. 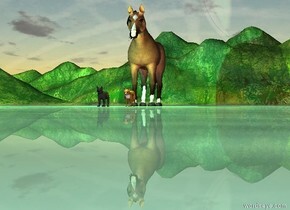 There is a transparent horse 6 feet inside an enormous transparent cube. 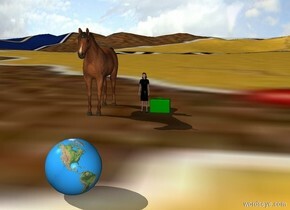 There is a white light on the horse.there is a large red light on the right of the cube. there is a large yellow light on the left of the cube. the lights are facing the horse. 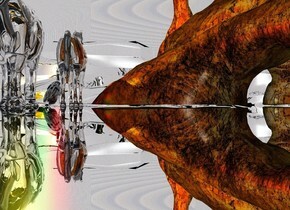 there is a large horse on the left of the cube. 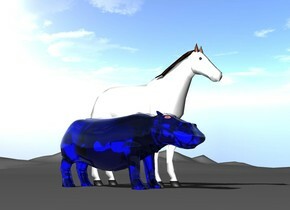 there is a large horse on the right of the cube. the first clear lavender blush glass cube is 3 feet wide. the second clear turquoise glass cube is 2 feet wide. the second clear turquoise glass cube is inside the first clear lavender blush glass cube. the third clear yellow glass cube is 1 foot wide. 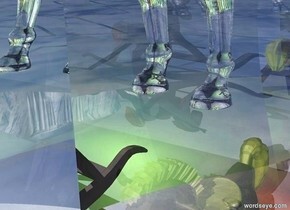 the second clear lime green glass cube is inside the second clear turquoise glass cube. there is a bright white light in the first clear lavender blush glass cube. the sky is cornsilk. the ground is reflective. a bright pink light is inside the first clear lavender blush glass cube. 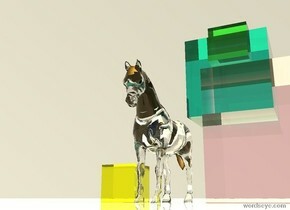 a small clear glass horse is 1 foot to the left of the first clear lavender blush glass cube. it is morning. the ground is water. the ground is grass. 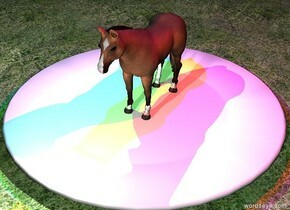 a very small horse is standing on a very large plate. it is night. there is a blue light 4 inches above the horse. 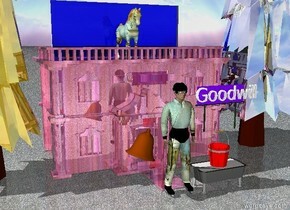 there is a red light 4 inches above and to the right of the horse. 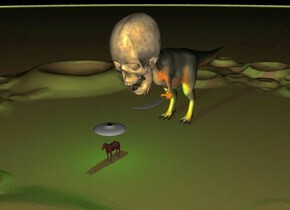 there is a green light 4 inches above and to the left of the horse. there is a white light 4 inches in front of the horse. the horse. 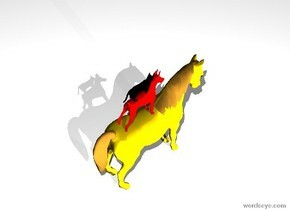 the dog is on the horse. the cat is on the dog. the horse is gold. the dog is red. the cat is black. the sky is white. the ground is white. 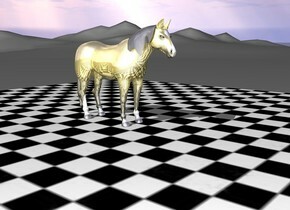 the illuminator is to the left of the horse. 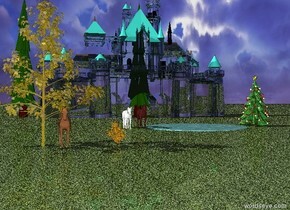 the illuminator is 10 feet away from the horse.